Catches your attention doesn’t it? The premise of the article was that by overloading our children with toys, activities, choices, etc. we overstimulate them, which can lead to behavioral issues or just general unhappiness. Stress? I have an almost 3-year-old son and twin 16-month-old sons. How much stress can there really be? But I know what she meant, and I knew I needed to keep reading. I’ve seen the difference in my twins before when I put them into a neat and sparsely filled play yard – say, right before the cleaning service is coming – compared to one loaded down with toys. Just when you think you need a bunch of toys to keep their attention, you find out they perk up just having extra space in which to roam. Kim John Payne, author of the book “Simplicity Parenting,” who is quoted throughout the article, makes some suggestions about how to go about de-cluttering toys: “Often, kids’ favorite toys are simple, classic toys without lots of bells and whistles – stuffed animals, dolls, building toys such as Legos, trains and cars, dress-up clothes, and arts and crafts materials,” she says. She suggests decluttering books. We are guilty of overload there too and just beginning to learn the value of using the library – largely for the sake of taking books back. Then Payne begins to make her case for keeping more than just the things around our kids neat and tidy but for simplifying the daily schedule too. My kids are too young for me to be carting them all over creation for a bunch of activities – yet – but I know the temptation is coming. I’m just as likely as anybody to fall into that trap. I’ve always erred on the side of staying busy rather than leaving time to go with the flow. I was one of those kids who always had afternoon activities, played sports in all three seasons, loaded up summers with camps and swim teams, and on and on. Now as a parent, my twins just recently gave up their morning nap and already I’m planning trips to the library, drop-in at the Y and playdates to fill that time. On Saturdays, my husband and I take our crew to family breakfast – which I was excited to see Payne give us some kudos for – but with our newfound freedom lately, we’ve been taking the kids on errand binges after that. We’ve been known to bop straight from Target to Costco to the grocery store, so that by the time we get home the boys might have 20 minutes to play before it’s time for lunch and nap and the day is almost gone. throughout and repeat: the family dinners, nature walks, reading together at bedtime, Saturday morning pancakes,” Payne says. When I actually stop to think about it, I realize that some of the most fun times for our boys come when I don’t plan a thing. There was an afternoon this past week, when I decided to go with the flow, rather than pack everybody up with snacks and water bottles and rush out the door to the park to take advantage of unseasonably warm weather before supper time. I fed them a leisurely snack then took 20-30 minutes to get down on the playroom floor with the twins. My favorite part was when both climbed up into my crossed legged lap to read one of their favorites “Moo, Baa, La La La!” by Sandra Boynton. All the while, our almost 3-year-old son Wade was just outside the sliding glass door from us with our nanny, happily driving his toy digger truck in a patch of dirt beside the driveway. 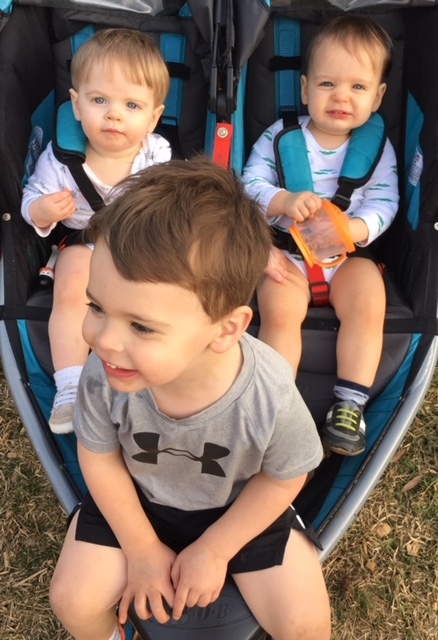 When we got to a natural break in the action, we piled everybody into a ride – a double stroller for the twins and a tricycle for Wade – and walked up the street to check out the trucks at a construction site nearby. At Wade’s suggestion, we stopped a time or two to listen for owls, and I think we actually heard one. 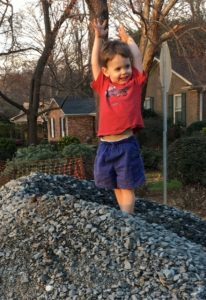 Once we got to the work site, we all watched as Wade climbed a pile of gravel, threw both hands up like he’d summited Everest and promptly slid back to the bottom on his bottom, making his mama glad he was at least wearing play clothes. On the way home, Wade stopped to get off the tricycle and toss a pile of leaves in the air. 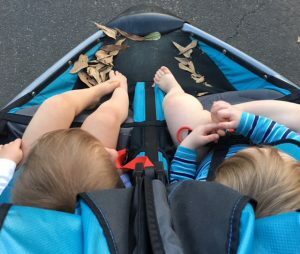 Then he decided to let his brothers in on the act and loaded some leaves onto the foot of their double stroller. Their barefooted little legs went to work right away kicking their own leaves up into the air. We got home in plenty of time for dinner – to stick to mama’s schedule – and to greet Daddy after work, happy and – well – calm. That afternoon, as well as the article on Facebook, was a great reminder that as a mom, I don’t always have to manufacture fun. I just have to give it room to roam. Is Anyone Else in the Pre-Thanksgiving-Christmas-Spirit? This is so true! And applies to all ages, even high school!